It was the spring of ’39, a time when the world around us was talking of another great war. Just as in pre-war 1911, the threat of war was changing the way we lived, the way we dressed, and the way we danced. Once known as a “product of mad times”, the Jitterbug was on its way, bringing us a wild new way of free-style dancing. Here in Verdun, we were already in the midst of another conflict, as Verdun’s Anti-Jitterbug Society was taking actions to literally stomp-out the menace that was already swinging its way north. The “bugs” had arrived, flailing their arms and legs, and throwing their bodies across the dance floor, and brushing the “naturally-flowing” dancers off to the side. It was only the beginning of what was to come, as the small corners of our world began to converge into a Jitterbug nation. The jim-jam-jump with the jumpin' jive, makes you get your kicks on the mellow side. Hep! Hep! “Bug” news came from around the world with stories of young girls dying instantly of heart attacks and of people collapsing of exhaustion after uncontrollably “jitterbugging”. Many school dance committees, dance halls and music clubs dealt with this new craze by imposing outright bans on jitterbug dancing. In that year, a pair of Jitterbug shoes sold for an expensive $3.95, with rubber soles and every inch covered with “swing-lingo inscriptions” for the coolest cats. It seemed that our local world had also gone C-U-R-AAA-ZY, as the jitterbugs took over all the “jam-joints” in town. The Seville Theater announced “Jitterbugs Attention – the Greatest Jam Session Ever! – See and hear from our screen – 2 solid hours of swing! 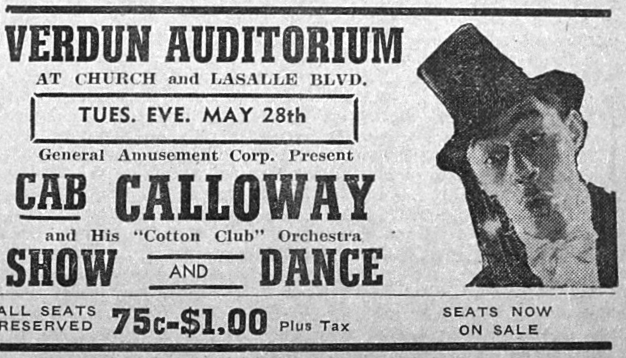 – Admission 20-cents – Everything goes including Dancing in the Aisles!”. Everyone was getting bitten by the bug, and they just couldn’t get enough of it. The jim-jam-jump with the solid jive, makes you nine foot tall when you're four foot five, Hep! hep! The early jitterbug was believed to be a mix of various swing dances, including the Lindy hop and the East Coast Swing. Using fast six-count steps, the man would lead on his left foot as a left-right-left-right-right-left, with his partner copying on the opposite foot. With multiple turns, lifts and spins, jitterbug partners often danced side by side, instead of face-to-face. After the basic steps, the “bugs” could then add complicated maneuvers, like through-the-leg swings! The more moves you knew, the more hep you were! 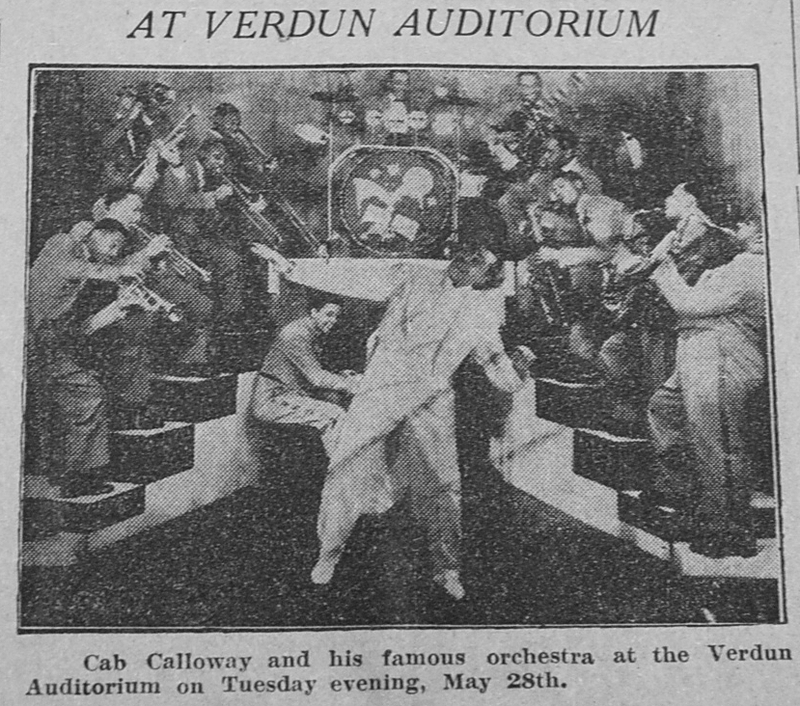 Bandleader, Cab Calloway and his Cotton Club Orchestra were the first “name band” to play at our Verdun Auditorium - admission was 75-cent to a dollar. On the night of May 28th, 1940, he introduced a new dance called the “Boog-it” to an enthusiastic crowd of 3,000 Verdun jitterbuggers, performing his ever-popular “Minnie the Moocher”, and his latest hit the “Jumpin’ Jive”. Calloway, known as the chief of Hi-de-ho, was the first to use the term “jitterbug” in his 1934 recording "Call of the Jitter Bug". Adding that the dancers looked as if they had the “jitters”, a prohibition term describing the hangover effects of alcohol or moonshine, then frequently referred to as “jitter sauce”. The jim-jam-jump with the jumpin' jive, makes you like your eggs on the Jersey side, Hep! hep! In 1939, "The Jitterbug" was also a number written for “The Wizard of Oz”. Although not in the final cut, the Wicked Witch of the West would release flying jitter “bugs" to compel the heroes into doing a jitterbug-style dance, quoting to the flying monkey leader, "I've sent a little insect on ahead to take the fight out of them." The song by Judy Garland, and some of the dialogue, made it to B-side of the Over the Rainbow. With the arrival of August, the young “Hep-cats” were dropping their numbered practice dance steps on to the floor. While Verdun Mayor, Herve Ferland, was pictured laying the cornerstone of the great Verdun Bandstand being erected near the corner of Woodland and LaSalle. As the stone was being lowered, the daily headlines of that time were ablaze with Jitterbug news, drawing fire from traditionalists, outright disgust from the clergy and severe health warnings from the establishment. Don't be that ickeroo, get hep and follow through; and make the joint jump like the gators do. Rex Billings Jr., president of Verdun’s Anti-Jitterbug Society, quoted in the local “Verdun Guardian” that a majority of folks have been forced from the floors through embarrassment or for the fear of being permanently disabled by the maniacal antics of the thoughtless “bugs”, who throw themselves in all directions. He blamed the guys more than the gals, as most girls assumed their popularity depended on their “jitterability”, and so they “jittered”. Adding that he has seen “healthy girls pass out after just one number”, and that jitterbugging is more like a marathon six-day bicycle race (held at the Montreal Forum) than a dance. 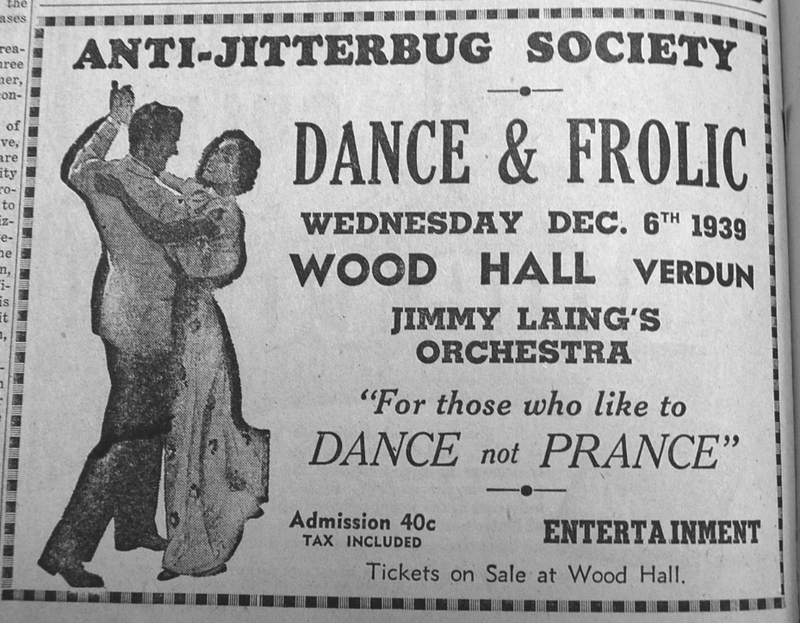 For this reason, the Anti-Jitterbug Society organized its own “Dance-and-Frolic” evenings at Wood Hall, for persons who believed in “natural” dancing, strictly outlawing the jitterbug. Their ads would quote, “For those who like to Dance not Prance”, admission 40-cents. Bandleader Jimmy Laing, known for his “disappearing” fingers on the piano, would lead his orchestra as a local favorite. As ’39 progressed, Verdun, still known as the third largest city in Quebec, was about to change its slang, as the new hepster lingo hit the streets. A “Hepcat” was “solid”, one who knew the latest jive words and who could really “cut a rug”, while an “Ickeroo” was the opposite. People were urged to shag on down to “slide in their jib” (dance) and get Hep. Hepcats spoke fluidly, as if rhyming their words to music and creating new ones in the process. Swing styles also had their own hep names, like the “Peckin’ Neckin’”, “Swing the Wing”, the “Rusty-Dusty”, the “Shorty-George”, and “Whip the Hip”. Even with this smooth new language, those times remained simple. Until, on September 10th, Canada finally declared war on Germany. Suddenly we would all be dancing for a different reason. As the reality of another World War crept in, we were comforted by the enjoyment of the few remaining moments of peace we had left, before being sent off to war. The Jitterbug craze would go on throughout the War and continue into the late fifties. As the wave finally crested, it was slowly replaced in our dance halls with the new sounds and steps of the early sixties. Just as our own elegant Verdun Dance Pavillion bandshell began to erode, we could feel the times of the Jitterbug slipping away, and with them our fondest memories. 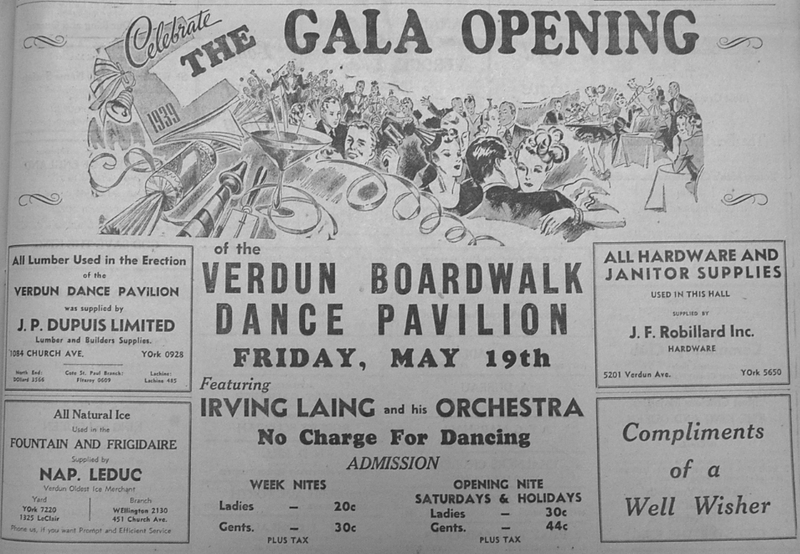 T he Verdun Bandstand was demolished in the late 1960’s, and not so long after, the Verdun Dance Pavillion was also torn down. Those ever-smiling dancers swaying, bopping, and twisting into the twilight of the night skies, are but just a memory now. Yet, whenever we hear that fast swing music, we are reminded of our once beautiful dance halls, with their flickering lights and their polished floors, awaiting our return. Giving us a reason to smile, knowing that we were all once part of a Jitterbug Nation…which had danced its way through our Southwest Corners. - Hep! hep!